KIWI Services’ Frisco, TX tile and grout cleaning methodology is simple — we take the grime out of grout so you don’t have to. If you have aging grout or tired-looking tiles, KIWI Services offers quick, effective services that thoroughly remove dirt, dust, mold and mildew from your tile and grout surfaces. With nearly three decades of grout and tile experience, we know the ins and outs of grout. We can clean any kind of tile and grout ranging from ceramic tile floors to tile and grout in showers or bathtubs. We use the gentlest but most effective grout and tile-cleaning products made to give your tiles and grout a clean and fresh look without scratching or marring the surface. Our specialized machines clean deep where old-fashioned methods can’t, while our buffers and bonnets will loosen impacted dirt particles and restore sparkle and luster. 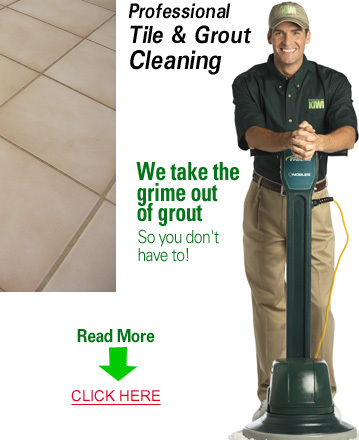 Give us a call at 972-354-0300 so we can help you take the grime out of your grout.